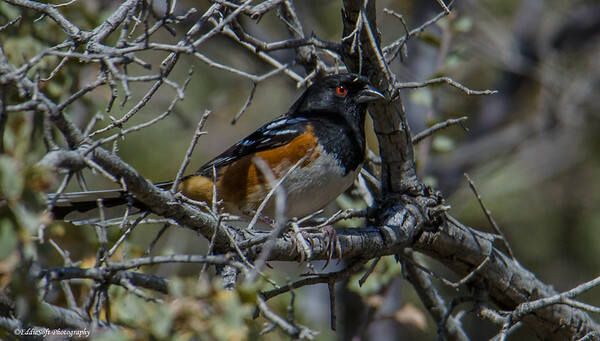 In case you are not familiar with this particular bird, it is a Spotted Towhee. I heard it rummaging around under the brush while we were visiting Red Rock Canyon National Conservation Area back in November. 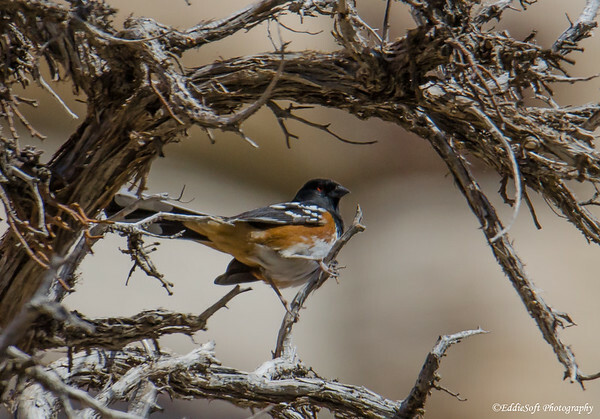 The Spotted Towhee hangs out exclusively in the western half of North America, year round on the western third with some migration further east, some scampering up into Canada and dipping into Central America during breeding. Contrast that with the Eastern Towhee that is exactly opposite. We are accustomed to seeing the Eastern where I live and fairly common to hear one while out in the field. I say hear instead of see because these birds can be tough to locate. They spend a majority of their time savaging in the underbrush. This particular specimen was doing exactly that when I encountered him. I was wasting large amounts of digital space trying to get a small and very hyper lizard into the tin. Luckily Linda had already gone back to the car since she absolutely hates these “snakes with legs” as she refers to them. I’ve had long talks with snakes that have decided to visit us in the country desperately trying to persuade them to make their way to the neighbors instead. Will they listen …. no, next thing you hear is a blood curdling scream followed by a verbal abuse that would wake the dead.. directed at me for allowing this to happen – damn snakes never listen to me. Sorry, I digress. In the midst of snapping shots of the lizard something rustled behind me. When you have big glass filled with lizard, you tend to get a bit jumpy under the suspicion it is all a distraction while the rest of the lizard gang tries to steal your wallet. A quick look back revealed a flash of orange as it ran about the undergrowth. Was pretty easy to deduce what it was, so the attention quickly changed to getting the Towhee tinned. Up the rocks, down the rocks, up the rocks, down the rocks, in the brush, out of the brush, back up the rocks to get above it, back down to track it into another area of brush. 45 minutes and I still had not been able to get a single shot off. Knowing that the ears were burning because of Linda and not the sun, decided enough was enough and turned my back. Sure enough, that Towhee burst out of the brush and landed in a tree. Just had enough time to get a couple of shots off before it move further into the brush. “Really, is this the way we are going to play this!” Apparently this specimen didn’t appreciate the tongue lashing as it popped back into view to give me a departing cold shoulder – Did get one shot of that smug face before it departed for good. That’s three shots in the tin – time to go apologize to Linda – a little game we play, I get self-involved in birding, I apologize, she knows I don’t really mean it, she remembers she chose to marry me with all my many faults, all’s good (although I probably should not have mentioned that a lizard was involved).